East Jakarta Transportation Sub-dept. (Sudinhub) installs traffic signs regarding odd-even implementation in six locations. It is done to inform road users related roads which implement odd-even policy.
" 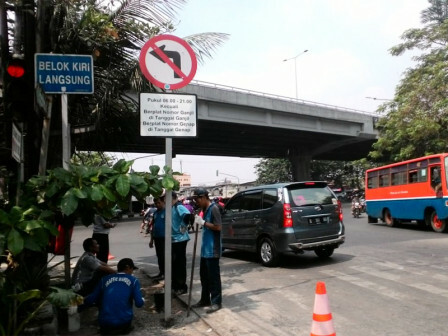 It is a part of socialization thus more road users will know about this odd-even system expansion"
East Jakarta Sudinhub's Traffic Section Head, Andreas Eman stated, his side has installed no turn signs due to odd-even expansion policy. Vehicles with license plates that end in odd number are forbidden to turn to that route on even-numbered dates and vice versa. The policy is applied every day starts from 6 AM to 9 PM. "No turn signs are installed on odd-even lanes. It is a part of socialization thus more road users will know about this odd-even system expansion," he explained, Monday (8/6). He hopes violations will be reduced by installing those traffic signs. Because those traffic signs are installed on strategic locations which are easy to be seen and read by road users. Those six strategic locations are on Jalan Otista Cawang Kompor, intersection on Jalan Perintis Kemerdekaan,intersection on Jalan Pemuda, intersection on perempatan Halim Baru and intersection on Jalan H. Ten Rawasari. "Prohibitory signs are installed because recently directional signs are also installed. Hopefully this can inform road users well thus more of them will obey the rules," he conveyed.